Fans have been wishing for years, and now if finally appears that an officially licensed James Bond product will be coming soon from Lego. The favourite toy for many has proved elusive for 007 fans despite Lego using many popular film franchises to co-brand their brick sets, from Harry Potter to Batman and Star Wars. A well-coordinated Twitter exchange between the official accounts of Lego, Aston Martin, and EON Productions indicates that a new Lego vehicle will be coming soon, most likely an Aston Martin as used in the James Bond film series. In the absence of official products, fans have been creating their own 007 themed Lego models for decades, some even publishing official looking instruction manuals. Above: One of many unofficial fan creations. 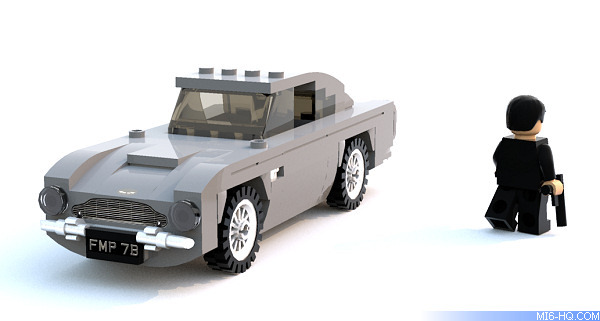 The classic Aston Martin DB5 may be the first set launched by Lego. MI6 understands that Lego had approached EON Productions in years past to create a series of James Bond sets. When the series rebooted with 'Casino Royale', Lego made another approach but the deal was passed by EON due to the ethical conflict of having toy guns and children mix with the adult character. Lego instead created their 'Agents' sub-brand which launched in 2008. Focussing on vehicles from the 007 franchise could have been the compromise that broke the deadlock.